Blame it on the vacuum left by the Olympics, but I’ve got a strong hankering for another round of window-shopping. 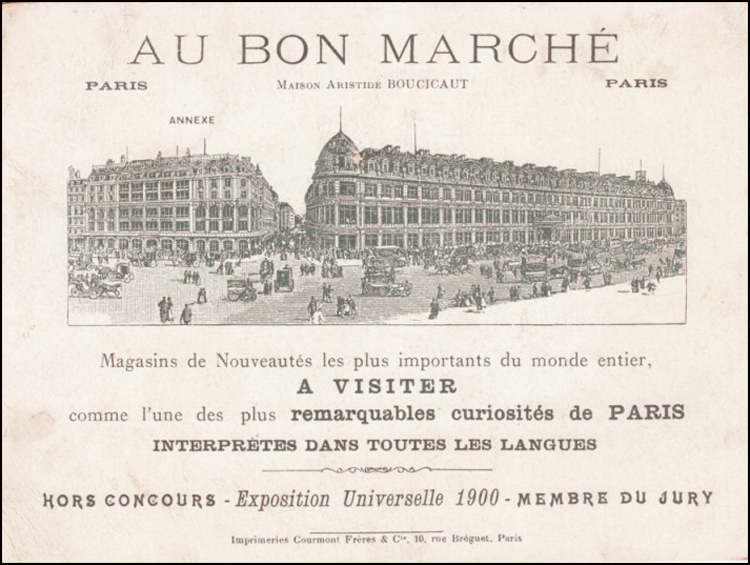 So this week, I’ve decided to trek it to Le Bon Marché, the very first department store in Paris (in fact, one of the world’s first). This iconic darling not only changed up the rules of retail, but also set waves of shopping frenzies in motion and acted as a muse to artists and writers of the avant-garde set. Plus, this is where is the 1920 Olympic flag was made! Who knew? So pack your charge plate and rose-colored glasses. A tribute we will pay! 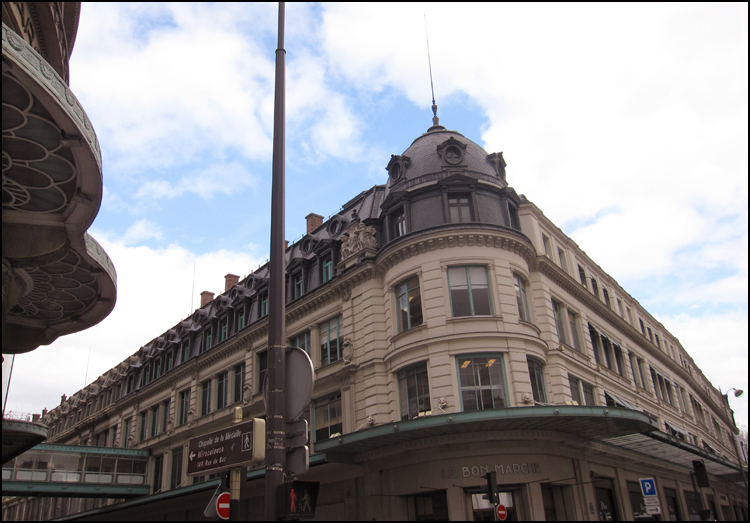 Flashback: “The cathedral of modern commerce!” is how Émile Zola neatly described Le Bon Marché (“the good deal”) in his novel “Le Bonheur des Dames.” The store was the first to launch fixed pricing, welcome stations staffed with English-speaking personal shoppers, and self-service. 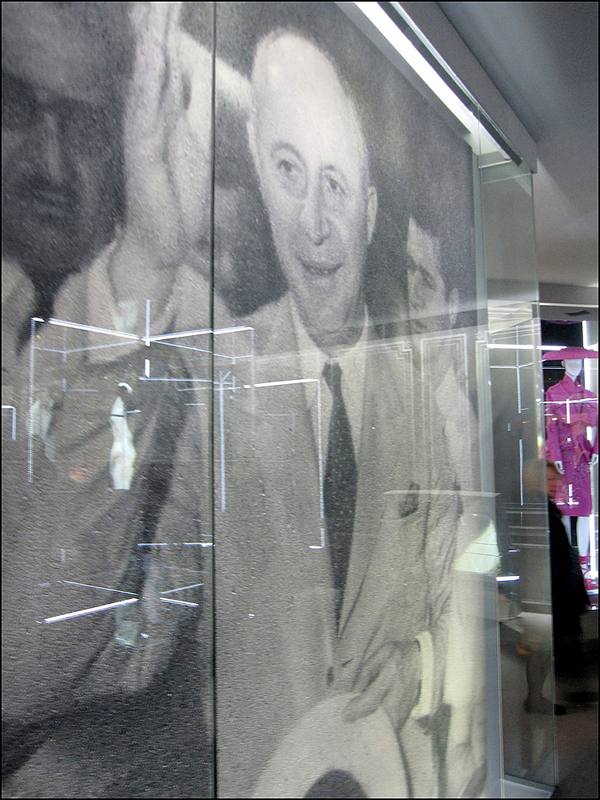 Soon faire du lèche-vitrine (“window licking”) became all the rage. Though now taken for granted, at the time its newfangled open-door retail concept meant that even prostitutes could shop here with ease. Both seductive and alluring, Bon Marché’s open aisles of enticing wares were often blamed for bankrupting families and inciting spontaneous shoplifting. During the 18-Eighties: Ninety percent of the shoppers were women, sometimes visiting the new “walk-around” palace on a daily basis. They were hooked. 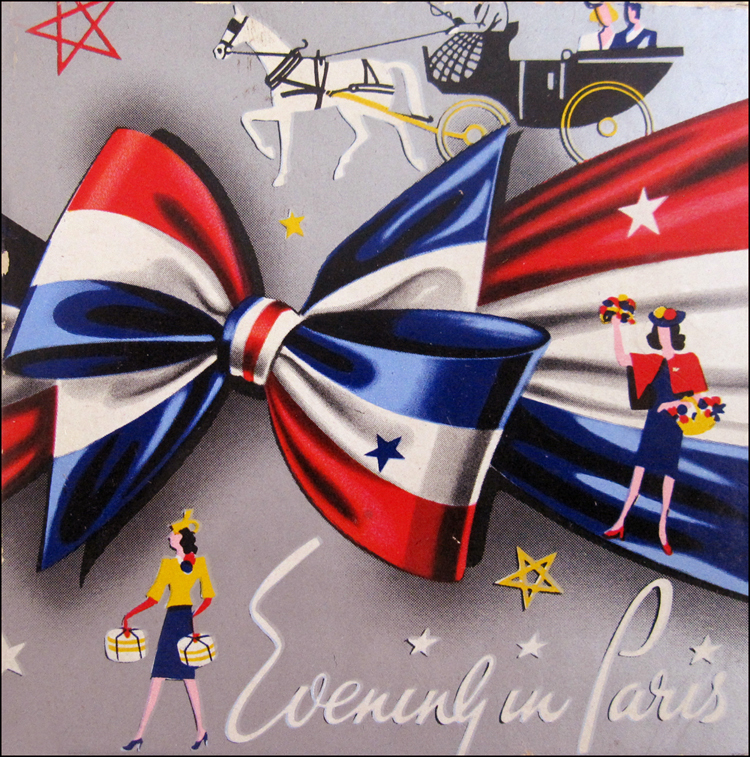 Even as the Prussian army surrounded the city in 1870, American and English fashionistas didn’t flee but kept on shopping, because a trip to Paris without having shopped would be a “life-long regret.” For the love of a half-empty bucket list, I can relate! Initially designed by Gustave Eiffel and Paul Sédille (who beautified Printemps, too), Bon Marché has maintained her radiant glow by getting a little work done now and then. It’s no secret that Andrée Putman (also credited with the extreme makeover of Guerlain’s flagship on the Champs-Élysées) recently updated the store’s look with sets of crisscrossing escalators. Surrounded by slender columns, the moving stairs’ geometric patterns smartly echo the skylight’s square glass panes. Though no longer considered quite the palace of “good deals” it was back in the time of Picasso and Hemingway (who bought his knock-off suits here), Le Bon Marché is still the place to window-gawk and trend-spot. You’ll find classics like Balenciaga, Dior, Lanvin, and Sonia Rykiel, along with funky designs by Comme des Garcons, Paul & Joe and Sandro. On the ground level, be wooed by “Le Théatre de la Beauté,” which specializes in just-launched, innovative, and difficult-to-find beauty products. So prior to your visit, do a little research and pack a wish list! Make your friends at home green with envy. Confession: Here is where I score my Annick Goutal perfume. My secret weapon ? It’s Petite Chérie but keep it under your hat! Mum’s the word! A fan for a decade, I usually buy the body cream because it’s less expensive and the scent isn’t as strong but still possesses staying power. Ask for their carte de fidélité. Return visits are rewarded. Tip: Often Bon Marché sponsors free exhibits. 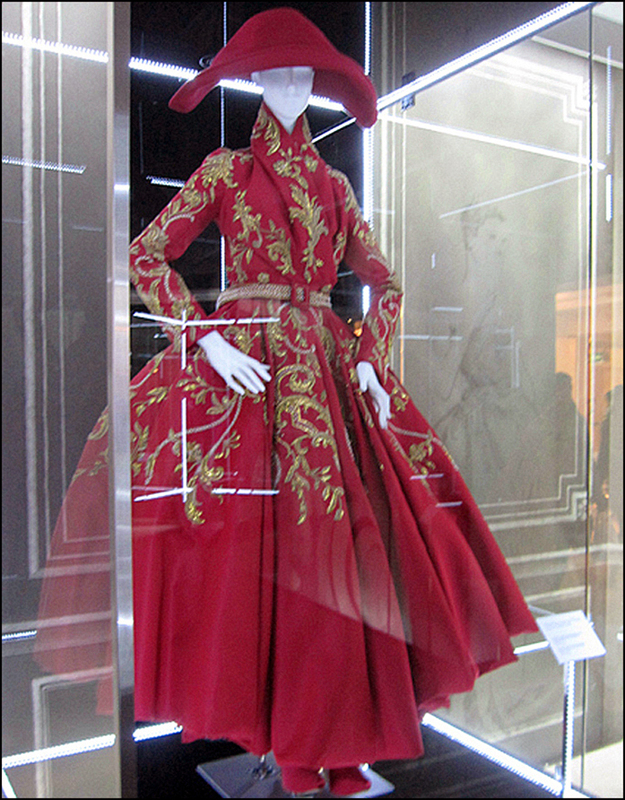 Recently my sister Wen and I got to see the Christian Dior exhibition. Decked out in Dior’s signature white and grey, the exhibit was made up of photographs, iconic “New Look” ensembles, super hip multimedia projections on oversized accessories like chairs, mannequins and hat boxes. Missed Dior? Fret not. There will be more to come! Feeling peckish or parched? In a separate part of Bon Marché, La Grande Epicerie de Paris (the world’s largest international food labyrinth) seems to have everything to satisfy every taste bud, both domestic and foreign. The Babylon Garden is just in front of the store, so stock up and prepare to nosh like there’s no tomorrow! Also, just behind Bon Marché, you’ll find the Chapel of the Miraculous Medal. Here’s a chance to balance out your mortal sins with a visit to Saint Catherine Labouré’s shrine. For the strong-hearted, the “incorruptible corpse” of the lady Herself is on full view in a glass case at the front of the sanctuary. Among other things, she’s credited with designing one of the most popular of saints’ medals, which are available on-site. She lived just a hop, skip and jump away, so I’m sure she was speaking from experience. There are a very great many things everybody is buying. There are a very great many things you are buying. There are a very great many things they are buying. Fabulous post as always and I love the picture of your sister! very cool! Looks like my husband when I went shopping on our honeymoon! LOL! I enjoy your series. Thank you!! Yes, Wen was very game. After she landed, we immediately hit the ground with a short run, and then we toured and shopped until we dropped. We stopped rue de Rennes, Châtelet, Saint-Germain-des-Prés, and Boulevard Haussmann. 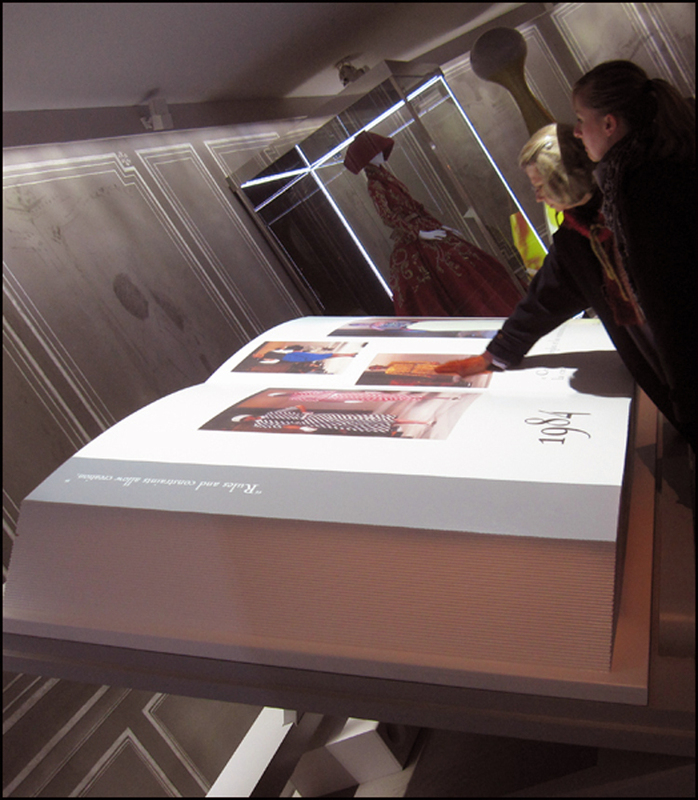 We also stopped by Musée de la Mode et du Textile. By l’heure bleue, we were beat. I also dig the statue and bench!! “Sous le chapeau” (under the hat) was created by sculptor András Lapis. It’s located in front of the Hungarian Institute at 92 rue Bonaparte in the 6th arrondissement. It’s the perfect backdrop of a photo-op!! T.
This is the most delightful article about a department store I have ever had the pleasure to read. It takes true talent to turn out exciting work such as this given the subject matter. I love the joy and passion you manage to project into your writing. I can only imagine how much crazy fun you must have when you’re ‘out and about’ given your attention to detail. Golly, gee—wham. You made my day. You made my week!! I AM grinning wide. Thank you. I always appreciate your thoughtful words and writing, too. Yes, your enthusiasm is contagious. Here’s to a week of productive writing for all. Enjoy the week!! T.
Too funny! I would think that would give them more jitters, if for nothing else than to get more brandy.) I like escalators but I would think the glass elevators or the ones on the outside of a building, could merit a shot of brandy. Have fun researching. Some years ago, when Megan and I were in London, we spent some time in Harrod’s and found the most delicious pork pie there. It was marvelous!! They have lots and lots of tea, too. Not far from there, we found a Japanese bakery that had the most wonderful Japanese goodies with red bean paste in them. Have you ever had that? It sounds terrible but is one of the most delicious things I’ve ever eaten. Japanese sweets of all types are never too sweet in the way too many American sweets are. Megan’s Japanese teacher once or twice brought us bean paste delicacies her husband brought back from Japan. Unbelievable. Oh, goodness. Thanks for the gastronomical tips!! Shopping without treats and soda pops is not the same experience. If you think of the name of the Japanese eatery, drop me a line. I agree with you. They’re both tasty and pretty. Maybe I’ll be able to spot the shop with the aid of Google Earth. I’ll give it a shot. I’d like to visit both Harrods and Selfridges. It’s been way too long. Thanks for the brainstorming session!! Back to the research. . .T. OK, I’m pretty sure this is it…http://www.kitchoan.com/?page_id=7#lct-lo. Are you going to London to conduct your research? If so, you can try some bean paste delicacies and tell me what you think. They can be a bit pricey but just get some individual ones and enjoy!! And if you’re ever going to be in the Chicago area, let me know. Could be lots of fun. Gosh,thank you for the lead and the research!! You beat me to the punch. I really appreciate it. The joint looks great. I will add it to my list. And yes, I’ll keep you posted on London treats and Chicago. Great idea!! Enjoy the week, T.
T’dora, how serendipitous! A friend just gave me a blue, special metal, “Mary medallion” from the shrine/chapel of Sister Catherine Labouré! According to brochure that accompanied my medallion, Sister Catherine died in 1876; I wonder if she shopped at Le Bon Marché for her shoes and such? Even Sisters shop, you know. Thanks, Karen!! Most Paris department stores have fantastical bookshops. You’d love it. Sacred places!! T.
Great post.. I’m looking for new ideas for my upcoming paris visit and a visit here is now on the list. Merci!! Yes, add Le Bon Marché to your list. You won’t be sorry. If you’re interested in window-shopping and grand magasins, I also recommend Galeries Lafayette and Printemps on Boulevard Haussmann (Métro Saint-Lazare), along with the former Samaritaine at Pont Neuf (Metro: Pont Neuf, line 7). For the love of architecture, all three are worth the trek!! T.
The Bon marché is one of my favorite ways to wile away a Parisian afternoon! Great post! I agree!! Le Bon Marché is the perfect spot for testing fragrances. Their beauty and cosmetics zone isn’t as hustling and bustling as Galeries Lafayette and Printemps. I like its tranquil vibe. Plus, they have comfy leather sofas. 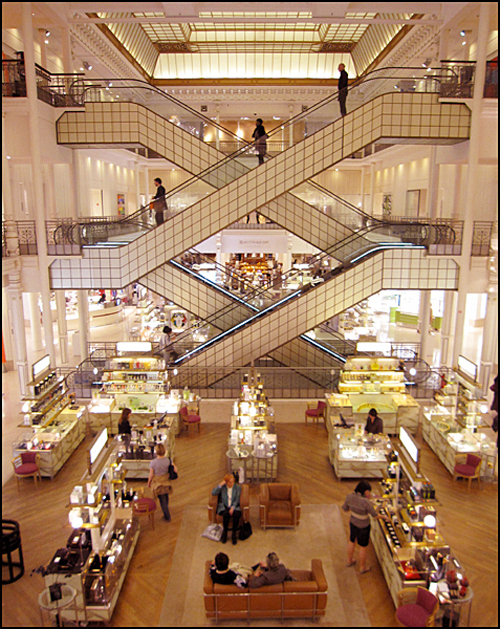 Do you have a favorite Paris department store? I miss Samaritaine and its rooftop. Sigh! T.
What a great story. Would have loved to have seen it ‘in the day’. Imagining shopping trips that would last an entire day, a completely fulfilling day. Wonderful. Oh. YES. It would have been great fun to hunt for knock-off duds with Hem back in the day, eh? And then kick back with a glass of wine. Dialing my time travel agent now. The suit also rises!! T.
HA! Need that number! 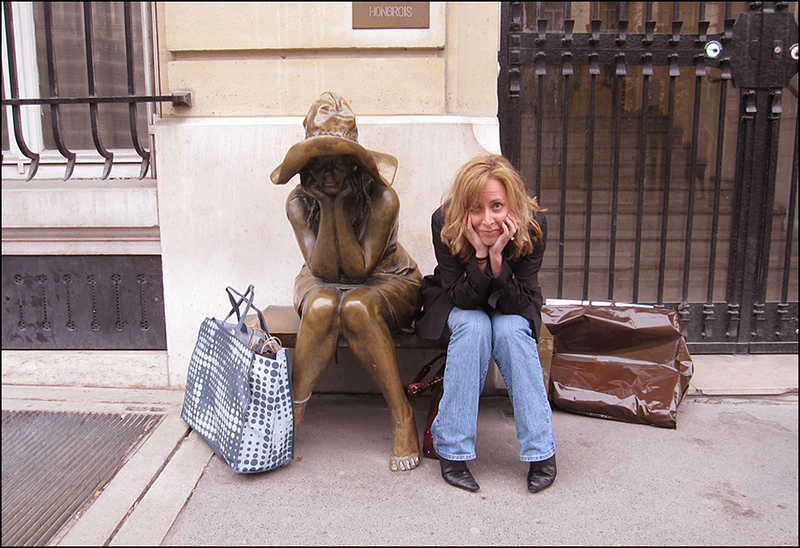 I’m in London October thru Mid November…I AM going to Paris! NOTHING will stop me! And thanks to you…I know where to go! Yay. Oh, la LA!! This is very exciting news. Watch out, Paris!! Yes, get the time travel agent on the horn immediately. Enjoy the trip planning. I love this phase. And feel free to ask questions!! T.
Thanks T…I definitely will. I’m actually looking again at all your posts…making notes! YaY! Thank you for sharing! That red dress and Dior hat are awesome! Ah, Mlle B, cet poste, c’est merveilleux!!! Merci beaucoup! How I would love to be “faire du leche-vitrine”! Merci, Pal!! Whenever I feel blue, I go for a window-shopping with camera in hand. It never fails to lift my spirit. The former Marshall Fields department store in Chicago also flaunts a gorgeous interior. I love it there. It would be great fun to create a portrait. Perhaps it will be a future mini-collaboration? B. You might not know…that the newly restored Carson’s on State Street is now a Target! Another beautiful, old building turned into a dreadful ‘shoplifter’s paradise’! Next time I’m down there (a week or two) I will shoot both…watch for the postcards, Mlle B.! 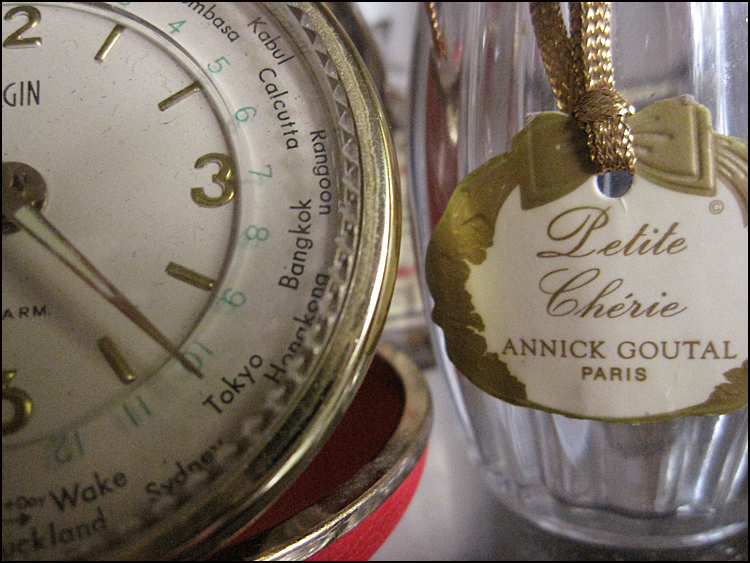 Love that Prussian war-time spirit in a crisis and as for Annick Goutal, so many wonderful scents to choose from! Yes, I would have probably kept shopping. Guilty!! Are you an Annick Goutal fan? I also adore their Eau de Charlotte (chocolate) and Eau d’Hadrien (lemon).” “When my ship comes in,” I’ll try a beauty treatment at their spa in Saint-Germain. Located kitty-corner to Saint-Sulpice, it’s another quiet space for experimenting with fragrances. Spray-on!! T.
Dior, Annick Goutal (my favorite is Gardenia Passion) the vintage emphemra. I would have a very hard time in Paris. Oh, yes. Annick Goutal’s Gardénia Passion is a favorite. It’s the perfect summertime scent. Oh, la la! T.
Bon Marche. The most beautiful sound I have ever heard. Bon Marche. Say it loud and there’s music playing. Say it soft and its almost like praying. Bon Marche. I’ll never stop saying Bon Marche. The most beautiful sound I have heard. Bon Marche. I do believe we have a Broadway hit happening here. V.
I love this post! Wonderful as usual! I love tripping the light fantastic around Le Bon Marche whenever I am in Paris so it was great to read some of the history of the store. I’m now singing along with Nat King Cole. OH, my! Hi Theadora. My favourite Parisian department store is Le Bon Marche especially, the wonderful food section, Le Grand Epicerie. I love when I am in Paris to visit shops which don’t have branches in my home town (Dublin) such as Agnes B, Repetto, APC and Journal Standard de Luxe. Despite all the very beautiful buildings in Paris the one that haunts my memory is the Corbusier’s Villa LaRoche. I’m digging your list. Repetto and Agnès B. have won my heart and hard-earned euros. I love Repetto’s window displays. The shop near the Opéra is a favorite. Corbusier’s Villa La Roche is also amazing. I agree. The memory of the visit lingers on and on. Enjoy the week!! T.
A great post, must confess I have also been on a shopping spree lately! LOL! Merci, A.!! Have you been buying treats for the new cat? T.
Loved the information. Must be so much fun to shop there. The poster with the two girls is beautiful. Ah, thank you!! 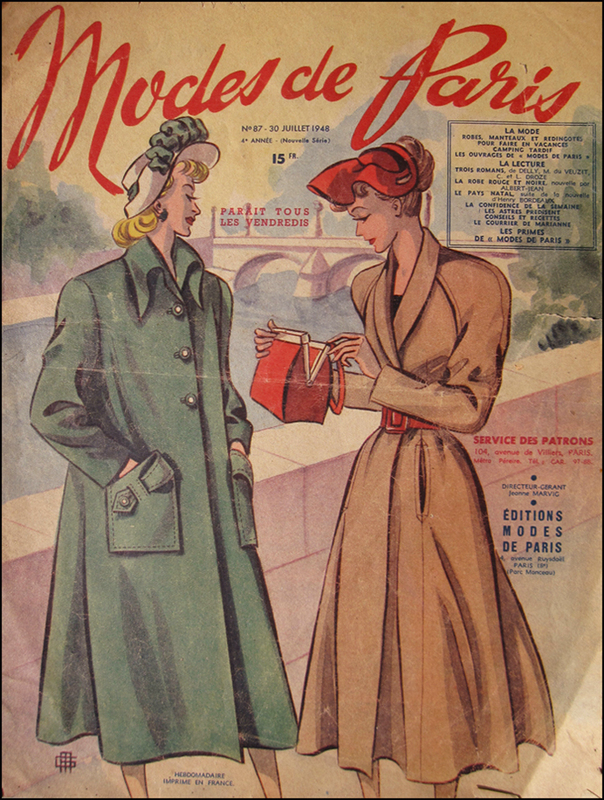 I also dig the 1948 Modes de Paris magazine.I scored it at the Saint-Ouen Flea for just a few euros. Lucky find! T.
Your story on Le Bon Marche brought back some childhood memories. Of course, not of the Paris store but one in Lowell MA. It was an impressive Bon Marche – I think it had six or seven floors. My mother brought us there to get suits for confirmation. As a kid, I loved to go to the top floor and watch the men getting shaves and haircuts in the barber shop. When the barbers would hone their razors on a leather strap, it was like being at the circus. I wonder how many stores throughout the world were name Bon Marche? Thanks for awakening a childhood memory. I loved your story about the barbers and their fancy handiwork! Like Edward Scissorhands? I’ve been studying photographs of your Bon Marché. What a looker. “The largest department store in New England” opened in 1887. And yes, the sixth floor boasted a barbershop and a beauty shop. Great memory! According to newspaper reports, the beauty closed its doors at 5:30 PM on January 10, 1976. Tears were shed. It then became a Jordan Marsh Department Store. Now the historic building flaunts a bookshop and restaurant. Luckily, the signage survived the multiple tenants. It’s lovely. Adding the store to my “grand magasin pilgrimage” list. Beautiful post! I was in a neighborhood for almost 2 years and it was a great time. Another beautifully calibrated post, T. Very nice pics – and nice to see your sister. Self portrait coming any time soon? tick. . .tick. . tick!! Your trip is just around the oorner. Yes, add Bon Marché to your list. It’s a great spot to try on scents in peace. It’s quiet space with plush, comfy sofas. Plus, there’s a park, a bookshop and a chocolate boutique nearby for the guys!! It’s a win-grin. I’m looking forward to reading your Paris reports. Feel free to ask questions. Cheers! T.
Thanks T! Yes, I am getting very excited about going. I need a lovely break! I indeed still have the bag. It’s a pearalized lavender leather hobo/crescent shaped bag and the strap has these cool interlocking rings that sit on the shoulder to look like a spider web. Longchamp makes the best bags, I think, but I’m biased towards anything French! theadora, wonderful atmosphere! a mix of past and present and your optimistic voice – a good start for my day! Ah, thank you!! I feel the same way about your moody-bluesy photography. Your work also rocks (flaunts!) a retro vibe. I always smile whenever I spot your top shot of James Dean. Sigh! Timeless. T.
Ah, thank you for your sweet words!! “Fun” is the name of the game, eh? Enjoy the week! T.
This is actually more original than Harrod’s! Great post! I went to Bon Marché on a recent trip to Paris- what an amazing place! I was entranced by the furniture department and the shoes. Swoon.. Merci!! Say, did you score any treasures?! T.
Thanks! My sister was beat but game. The “Sous le Chapeau” sculpture was created by András Lapis. It was the perfect post-shopping photo-op! T.
This blog has SO much style! You made me smile again, though! – as a non-shopper myself, I found the concept and picture of ”shopping break” very amusing – I thought shopping WAS the break! And goodness, they actually have sculptures of hoping breaks!? Thanks so much for such richly researched postings. Thank YOU for the big giggle. Truth be bold: Bargain shopping is a favorite serious business. Breaks are oh-so necessary or the dogs (feet) start barking—as my grandmother would say!! T.
Whoa, Sunflower! Wait a minute. Stop the presses. Shut the patio door. 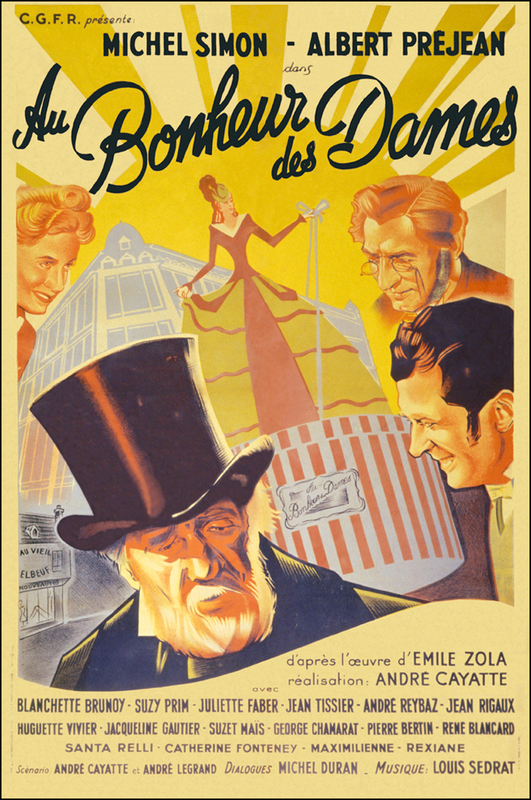 There’s a documentary about Bon Marché? Thanks for sharing! I’m off now to track it down. If you think of the name, drop me a line!! T.
Summer. She’s a tricky one. Watch out. She loves the encore. Alain Figaret. Thanks for the nugget. I checked out his website. The scarves and blouses are magnificent. I’ve got my eye on the “Echarpe imprimé cachemire vert en modal.” It’s green AND fabulous. So here’s the deal: Monsieur Figaret has been creating shirts since 1968. His shops are scattered throughout Paris. A few years ago, he celebrated The “24 Heures du Mans” and Jacky Ickx (1969 winner) with a limited collection. You see, we have Jacky to thank for protesting the traditional (and dangerous) Le Mans start. It was then changed in 1970. Interesting! And speaking of danger, whenever I compete in a Paris foot race, I always position myself behind the pompiers (firemen)! Oh, la la. They encourage with winks and charm!